Recycling areas and spaces: Struggling industrial districts (such as those in Berkeley and Emeryville, Calif.) are reconceived as vital urban restaurant and retail centers. Tilt-up warehouses and board-formed machine shops resurface as Old Navy stores, cool boutiques and art galleries. And all of this while still maintaining some sense of their original funkiness and history. Recycling building parts: Revitalizing, rather than replacing, walls, ceilings and floors. Some of my favorite floors have been those that have lived a previous life. They were always concrete, but were only allowed to be concrete in a limited way. Most often, they served only as structural substrates. 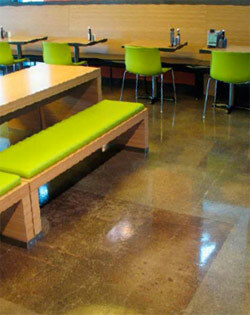 They were concrete covered by tile or sheet goods such as carpet or vinyl. Sensory concrete yearning to escape. Wounded concrete that may have been trenched and/or patched, sometimes repeatedly, over years and years of loyal service. And you might say, that as The Concretist, we were able to help them come out...come out as concrete. Honest, and completely concrete in all ways, warts and all. And therein lies its beauty! First, to remove the dirty old clothes. Less-invasive chemical strippers, followed by a good scrub and rinse, may be able to remove old paint or adhesives following the stripping of carpet or linoleum. For consistency, these should generally be used over the surface as a whole. If you are successful in removing residues and old staining, the troweled cement paste has been minimally damaged. It may then be stained or dyed for a facelift, or it may simply be sealed. In any case, the concrete is exposed and still obviously concrete perceived as concrete. Traditional scraping or spring-loaded, carbide-tipped hex pins mounted vertically on a 17-inch floor machine may also work. However, these are more invasive and may significantly scratch the original concrete surface. Shotblasting may work as well, but again, it's more invasive. It will at least pit the surface, exposing fine aggregates, and open up what may have been previously unseen cracks. Another disadvantage to shotblasting is the pattern the machine leaves in its wake. It's kind of like the pattern left on the lawn after a beer, a cigar and a good Saturday mow. Shadows and lighting "hot spots" add to the multilayered composition that is this cafeteria floor at the University of California, Berkeley. I must say that perhaps my favorite technique for prepping an existing concrete for a relaunch is to first shotblast, then follow with a diamond grind. 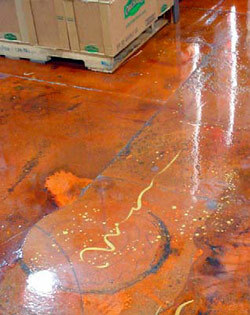 The slab can then be decorated, colored or simply sealed as appropriate. "Wait a minute," you say. "Why not polish? Everyone seems to be polishing nowadays!" Ah, good question! Thanks! I'm not quite as hot on polishing as a lot of others in the industry. The equipment is expensive. There's quite a steep learning curve for consistent success. And, in my opinion, contrary to a lot of people's claims otherwise, the floors still need to be well maintained. There is a place for polishing, and a good polisher can produce a really good result. However, one of the requirements of producing a really good polished job is starting with a floor that's flat. And in the case of an existing concrete slab that was covered and never intended to be exposed - this floor is often not so flat. Anyway, back to prepping for relaunch...Shotblasting exposes fines in extreme low areas. These fines are visually not that different from the fines exposed through grinding, but these areas would have been most likely missed if polishing. (I picked up this shotblasting technique from Dennis Perez of Nor-Cal Industrial Floors Inc. He's one of the top floor prep guys in the business!) Sometimes you're shooting for a deep enough grind to remove these elevation differences, but sometimes not. If you're shooting for a lighter grind (trying to expose sand only), just realize that the universe is more likely in control than you are. You're likely to get some large aggregates along with your fines. In my mind, this is great! It's very similar to taking a walk on the beach and coming across some keen shells and an occasional sand dollar. You'd have never thought to have flown to Tahiti and had control over where the shells on the beach washed up, so why have any other expectation now? Art flourishes made sense of the beat-up floor of this Nugget Market in Sacramento, Calif., and supported the client's cool and funky style. In performing work in the style of sensory concrete, our relationship with the floor often takes the form of an interesting conversation. The concrete throws something out. We mull it over and respond. And back and forth. And back and forth. More often than not, we don't try to change the basic nature of the concrete. Joints are joints. Cracks are cracks. Spalls are spalls. And trenches and patches are...you guessed it! We often choose to graphically respond to these with color drifts or shapes that play well off the concrete's unique personality (and, sometimes, dare I say, quirks). Generally, scratches and textural differences in low areas, where the slab has been blasted by steel shot but not quite reached by the diamond grinder, are filled in and made visually transparent by sealing and, where appropriate, finishing or waxing. I'm of the opinion that stains and dyes penetrate especially deeply, as do topically applied sealers, on this type of surface. Additionally, when maintenance is lax or sealers don't quite do their job, the fine and large aggregates (the strongest part of most concrete) kick in and take the brunt of the wear. Any vulnerable cement paste has been pre-removed. It's a nifty system, as evidenced by the pictures of University of California, Berkeley's new cafeteria and Nugget Market Inc.'s Florin Road store in Sacramento. Note the two different graphic styles. Both were existing floors transformed from structural to sensory concrete through this technique. And both are performing well. But, mostly, I'm interested in just walking these floors and being surprised. I'm generally most impressed when it's the universe that's been in control rather than me. Serendipity is a wonderful thing! I think I'll go walk some sidewalks through town now, and finish up down along the beach. Bye. In case you had any doubts... surface prep is everything. The most important thing about a microtopping is what lies underneath.